Our last competition of the 2019 EDAP season, CEEF’s ninth annual Energy Day Art, Essay, and Video Contest is perfect for creative students who are interested in STEM!. And the BONUS is that the winning students’ sponsoring teacher or adult who helps with the submittal process also wins a cash GC! CEEF and Energy Day are hosting the ninth annual Art, Essay, and Media contest. This contest invites students of all ages (and their teachers!) to compete for prizes ranging from $50-$250. For more information on entering or for any other questions, contact Paige Barnes. Winning entries will be featured on CEEF’s and Energy Day’s websites and social media. In addition, winning students and their teachers will receive cash GC’s and will be recognized on stage at Energy Day on October 19, 2019. 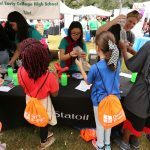 Energy Day Festival is a FREE family event for students and their families looking to enhance their education in S.T.E.M. fields. Energy Day is a Registered Trademark of Consumer Energy Alliance.